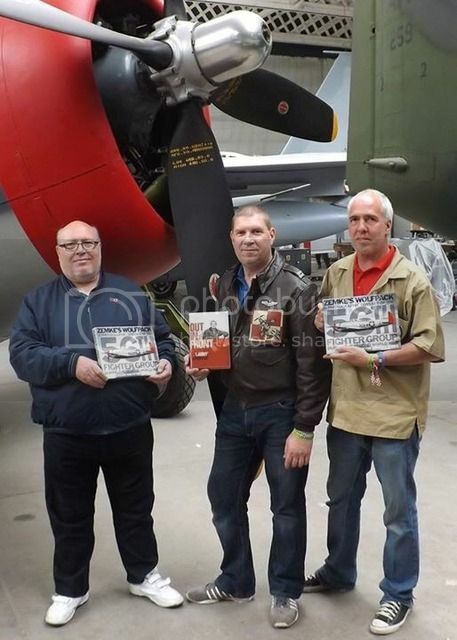 Peter and I had a great weekend at Flying Legends for the official launch of our book "Zemkes Wolfpack, A Photographic Odyssey of the 56th Fighter Group" accompanied by Krys Lanowski promoting his dad's memoirs "Out In Front"
A very few of the silver gilt edged/ slip case special editions are still available. These are signed and come complete with numbered certificates of authenticity. Very well done mate, will you have any copies at Telford? Just some of the ways this book is being described by reviewers.